One of our favorite friends online, Canine Journal, has been publishing content for roughly eleven years since its inception in 2007. They are the online portal to all things dog: training, caring, feeding, and yep, even information about insuring your dog fuels this wonderful resource. We sat down with founders Alex and Michelle to ask them the hard-hitting questions about Canine Journal, as well as a few tricks of the trade. HPPI: What’s the story behind Canine Journal? When did it start, why did you start it, etc.? Michelle: I have always LOVED dogs and had been trying to find a way to live my passion while making a living. In 2007, I was working full time at an advertising agency when I started hand sewing and selling custom dog collars and leashes on the side. I sold them direct-to-consumer via the website Fashion-Hound.com. Alex: While Michelle was working on her dog collar business, I was growing my web development company Contract Web Development, Inc. I thought, why not apply my content marketing and SEO efforts to Michelle’s dog site so we can sell more collars? And the traffic started to grow. In fact, the traffic outgrew Michelle’s interest in sewing! By 2012, I had transitioned my web development company to online publishing. My team grew, and Michelle joined me full-time around the time the transition completed. Web development and client services were phased out so we could focus on the new company, Cover Story Media, Inc. This coincided with Michelle halting dog collar sales and we rebranded Fashion-Hound.com to CanineJournal.com, one of Cover Story Media’s many brands at the time (we since have consolidated the brand portfolio down to 6 sites). Today, CanineJournal.com is helping more pet owners than ever before. We are thrilled to have found a way to provide readers with the ultimate go-to guide for all things dog. HPPI: As verifiable dog lovers, you must love the content you write. What’s the most popular topic you cover, what’s the weirdest, and what do you want to tackle but haven’t gotten around to yet? Michelle: We adore our jobs. 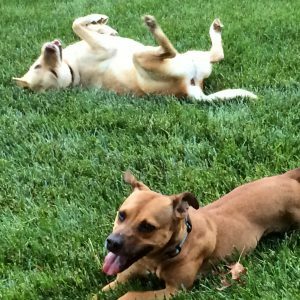 Who else gets to write, read and discuss dogs all day?… well, except maybe your team at Healthy Paws! Our Top Dog feature where we interview celebrity dogs is definitely the most fun part of the job! As far as Canine Journal’s most popular content, it’s the dog health concerns and how to proactively prevent them – think treatments for upset stomachs, which foods to never feed your dog, getting rid of fleas and ticks, best pet insurance, etc. I’m not sure if you would consider it a “weird” topic, but we did write about what does your dog’s poop color mean? HPPI: As dog experts, what do you wish you knew about them before you became a dog parent? Michelle: I grew up with shih tzus, but I had never raised my own dog until I graduated from college and moved out on my own with my first pup. 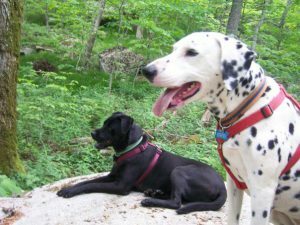 Domino the Dalmatian was 11 months old when I adopted him and a much bigger and more protective dog than I had ever known. I wish I had better understood the training, patience and sheer strength it would take to raise him. I also wish I had understood the importance of maintaining my alpha status by keeping him off the furniture. Taking him out in public always made me nervous, which he read as fear. I often struggled to keep him from barking and jumping on others and I regularly wonder, if I had known all of this, could he have been a better behaved and happier dog? I think, yes! Our dogs since Domino have all been much better adjusted and easier to manage. Alex: Michelle’s dog Domino was my first dog. Previously I wasn’t a big pet person, maybe because as a child we were only allowed to own “smaller” pets (rabbits, hamsters, rats, etc. ), since the landlords wouldn’t allow dogs. I learned a lot from Domino – the biggest lesson was positive reinforcement. There is never a reason to hit a dog. I learned that dog’s memories of an event are associated immediately with the next event, so if the dog does something bad, you get home, and then smack them and say, “bad dog!” – they’re just going to think you’re crazy, because they’re not associating the “bad dog” with what they actually did wrong. Positive reinforcement by rewarding good behavior with treats, dog walks, etc. makes training not only more effective, but enhances your relationship with your pup. Another way to look at this is to view your dog as your kid, which they are – dogs have become integral parts of our family and I couldn’t imagine ever being without them. HPPI: And what’s been the biggest hurdle in day-to-day dog training? How do you summon up patience when you need it most? Michelle: All of our dogs are rescues so we don’t know their back story, especially when you adopt at four years old, like we did with our current pup Lily. She has presented many of our biggest hurdles because she is so timid and nervous about everything. We just want her to feel safe and loved. But, she digs in the yard all the time and comes back with the muddiest paws you’ve ever seen. Keeping our patience with this almost daily activity has been a definite challenge and trying to un-train her innate behaviors of digging and hunting are nearly impossible. Good thing she is such a lovable troublemaker! HPPI: What’s one thing that has been your savior with having dogs? For example, with my dog, it’s either cheese or this little rope we sometimes have to carry with us on walks because she loves to play tug-of-war. Michelle: Bella and Lily, the dogs we have now, are pretty happy-go-lucky and love each other more than any toy. So, we can take them along without much of anything else other than their leashes. But, when we have to take one without the other, you would think the world was ending! 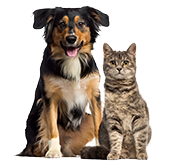 Check out Canine Journal’s extensive coverage and research on pet insurance, which includes comparison tables and reviews. When you’re done, head on back over to Healthy Paws to get started with your free quote today! Every quote means a donation to a homeless pet’s medical care and treatment.